ECCC is my absolute favorite convention of the year, and it is SHOCKINGLY close to happening nowish. 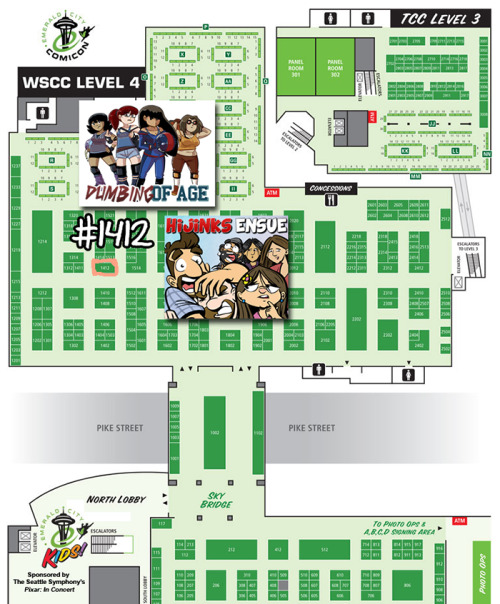 David and I will be at booth #1412 right next to Cyanide & Happiness! I will have the leftover DDDT prints, other prints, books, shirts, Wil Wheaton plushies and sketches. “The Experiment: Making a Living Doing What you Love” / Saturday, March 29, 6:00pm, ROOM 3AB. THIS is the one I REEEEEEALLY need you to show up for. My first ever totally SOLO panel. Seattle always takes AMAZING care of me, but for the uninitiated, offerings in the forms of tasty treats (cookies, cakes, Cadburry Creme Eggs, Starbucks Doubleshots [the tiny cans, NOT the energy drinks]) and tasty booze (DELICIOUS BOOZE) are always accepted and appreciated. Tiny booze bottles will have their contents slipped stealthily into my drinks at restaurants, while larger bottles will have to contents shared with my cartoonist friends in various hotels rooms in your fair city. Posted in Comic Blog and tagged conventions, emerald city comicon, news. ← HijiNKS ENSUE Is On Patreon! OK, this bodes an important question, do you guys do 'easter eggs' in the UK sense over there? I'm not sure I know what "'easter eggs' in the UK sense" means, but I am intrigued. In order to assuage parental guilt you often also get the hollow eggs along with merchandise (so in a branded mug, a bit like a normal egg in an egg cup). Too bad the con's been sold out for months. It\’s been sold out for a week or so, but I still want those with tickets to know about my panels. What is ECCC's policy on bringing booze in? It is clear that you aren't allowed to consume it inside, but less clear on bring it in as a gift for someone else. I think if you start asking about policies you (and i) are going to be very disappointed.